Quick to learn! Start tossing food in minutes! A fast action, light-hearted, miniatures combat game! Includes 16 miniatures of your favourite characters! Prepare for the food fight to end all food fights! in an all-star, jam-packed, crossover event featuring Nickelodeon's Spongebob Squarepants, Hey Arnold! Rugrats, and Invader Zim. 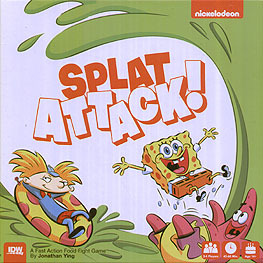 In Nickelodeon's Splat Attack! you select a team and then head to the cafeteria to unload your tray! Sling unique food items, roll dice to hit, and place splat tokens on your opponents! If a character is completely covered with splats, then they're splat-ed out of the game!